Harry Smith on Sunday actually asked an anti-Arizona SB-1070 advocate whether or not the United States government should stem the flow of illegal immigrants into America. 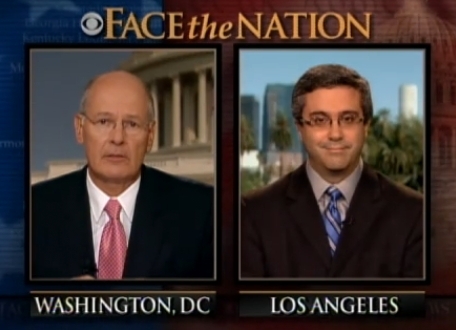 Subbing for Bob Schieffer on CBS's "Face the Nation," Smith invited on Thomas Saenz, the head of the Mexican American Legal Defense & Education Fund, a pro-illegal immigrant group. Early in the segment, Smith asked his guest, "Do you feel like the federal government is doing enough to stem the flow of illegal immigrants and -- or should it?" HARRY SMITH, HOST: Now let's turn to a top opponent of the Arizona law, Thomas Saenz president of the Mexican-American Legal Defense and Education Fund. He is in Los Angeles this morning. Good morning, Sir. THOMAS SAENZ (President, MALDEF): Good morning. HARRY SMITH: How should state and local governments stop the flow of illegal immigrants into the United States? THOMAS SAENZ: -- so the state and local government have no role to play in that regard except through their representatives in Washington. HARRY SMITH: And do you feel like the federal government is doing enough to stem the flow of illegal immigrants and-- or should it? THOMAS SAENZ: Well, I think the fact that there are millions of people in this country who have toiled here for years and in some cases decades contributing to our economy, contributing to our culture, contributing to our community, in many cases raising United States' citizen children here is an indicator of the fact that we need comprehensive immigration reform. That issue has been on our national agenda for over a decade. And it's more than time for our representatives in Washington to-- to move on enacting concrete steps toward arriving at an immigration system that is fair and better serves our national interests. HARRY SMITH: Well, it sure doesn't seem as if that is bound to happen any time soon. Do you -- do you view laws like the Arizona law that was by and large struck down this week? Do you view laws like this as anti-Hispanic? In case you were at all confused about Smith's position on illegal immigration, in the prior segment he asked Sen. Jon Kyl (R-Ariz), "And very quickly finally, bills like the Arizona laws and others are seen -- are perceived at least in some communities or in many communities thought to be anti-Hispanic. Could that cost Republicans?" Despite polls showing Americans overwhelmingly support SB-1070, Smith didn't ask Kyl if this could help Republicans and/or hurt Democrats. Exit question: Does Smith win today's "Only Someone as Brain-dead as Rick Sanchez Can Ask a Question That Dumb" award?